[S310] Julia Miller, Fairfield OH Genforum message 117 in "Re: Adam Langle b1836 PA > OH," message January 28, 2000. [S1482] 1870 U.S. Population Census, Ohio, Fairfield County, Violet Township, sheet 1/89/346, line 8, dwelling 2, family 2, Ohio, Fairfield County. [S483] 1850 U. S. Census population schedule, Ohio, Fairfield County, Violet Township, pages 159B and 160A, line 34, dweling 438, family 438. [S240] 1880 U. S. Census population schedule, Ohio, Fairfield County, Violet Township, ED 198, page 25, lin 13, dwelling 199, family 201. [S1197] 1860 U. S. Census, Ohio, Fairfield County, Violet Township, sheet 178, line 33, dwelling 656, family 640, Ohio, Fairfield County. [S1264] Marilyn, "Langel/Lingel," e-mail to Julia Langel, March 21, 2003, Langel/Lingel. [S1151] International Genealogical Index (IGI), Eliza Behney - David Lengel Marriage. [S1462] Probate Case Files 2575 and 5239, Will. [S1462] Probate Case Files 2575 and 5239, Document Jacket. [S1462] Probate Case Files 2575 and 5239, Receipts for Expenses. [S1462] Probate Case Files 2575 and 5239, Daniel and Henry Lengle Estate Account, receipts for distributions from heirs. [S783] David Langel, Eliza Langel and Malinda Langel Cemetery Marker, Mt. 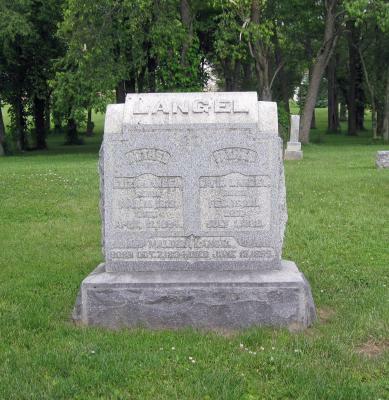 Carmel Cemetery, Liberty Township, Fairfield Co, OH, (Jan Murphey reads as July 1, 1898). [S1484] Fairfield County, Ohio, Probate Case Files 6975 and 7072. [S1484] Fairfield County, Ohio, Probate Case Files 6975 and 7072, court fees. [S1484] Fairfield County, Ohio, Probate Case Files 6975 and 7072, appraisal. [S1484] Fairfield County, Ohio, Probate Case Files 6975 and 7072, public auction. [S1484] Fairfield County, Ohio, Probate Case Files 6975 and 7072, election of widow. [S1484] Fairfield County, Ohio, Probate Case Files 6975 and 7072, Cost Bill, November 23, 1888. [S1484] Fairfield County, Ohio, Probate Case Files 6975 and 7072, Probate Account, June 10, 1890. [S1484] Fairfield County, Ohio, Probate Case Files 6975 and 7072, Probate Account, September 16, 1892. [S1484] Fairfield County, Ohio, Probate Case Files 6975 and 7072, Probate Account, December 15, 1893. [S1484] Fairfield County, Ohio, Probate Case Files 6975 and 7072, Probate Account, July 13, 1895. [S483] 1850 U. S. Census population schedule, unknown cd2. [S238] 1900 U. S. Census, population schedule, unknown cd2.